As a Jew, there are times I feel equidistant from the Muslim and the Christian worlds. Living in Brooklyn, I am fortunate enough to speak regularly with Jews from Arab and Muslim countries. There was a time when the Arab world was a place of refuge of refuge from the Spanish Inquisition. Even before the founding of the State of Israel, the Muslim attitude towards Jews fluctuated in different places between benevolent and virulently intolerant. There are Jews from Morocco who speak a Jewish Arabic that has the same relationship to regular Arabic that Yiddish does to German. There are a lot of kosher recipes that are indistinguishable from local Arab cuisine. A major strategic blunder made in the Arab world was its de facto expulsion of its Jews. From Algeria to Syria, from Libya to Iraq and Egypt were thriving large Jewish communities of over a million strong. Of those communities, only a handful remain. After expropriations, pogroms and pervasive discrimination, the Jews of the Arab world were forced to seek refuge elsewhere. As a result, those who wish to experience the living culture of Arab Jews must go to Israel. Most Jews in Arab countries left because they had to. In expelling its Jews, the Arab countries that did so created a necessity for the State of Israel. I feel a particular sadness when I think of Libya, a country that is almost devoid of any Jews. There were in Libya both Italian Jews and Jews who were indigenous to Libya. Oddly enough, one of the few Jews remaining in Libya is its leader, Muamar Kadaffy, whose mother was converted to Islam at the age of nine. ( http://jewishrefugees.blogspot.com/2009/10/was-gaddafi-jew.html ) This story has been circulating for years. If Kadafy discovered his Jewish roots, came back to Judaism and became an all around nice guy, I would be delighted. I found a very nice video that was a compilation of postage stamps featuring Libyan children's drawings. The colour in the drawings as well as the subject material are very compelling. It is accompanied by a very catchy song. Looking at the postage stamps of a country provides an interesting glimpse into their thinking. 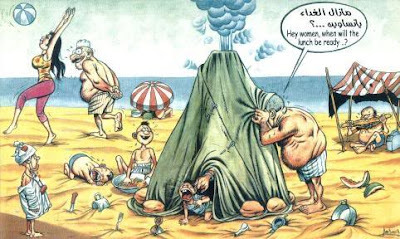 I was delighted to discover the cartoons of Mohammed Zwawi, whose cartoons provide a comical glimpse into life in Libya. When two countries have a tense relationship, it is easy to forget the lives of common people behind the scenes. Mohamed Zwawi restores this perspective in a welcome way. Centuries of Jewish presence in the Arab world shape my attitude towards it. My father always made it clear to me that despite having been forced to leave Germany, he still felt a connection to German culture. I feel the same way about the Arab world Salaam, Shalom... I hope and pray there will be peace soon. I have muslim background though atheist and i feel sorry that my country lost all his jewish cutural background. Remains happily the andalousian music.